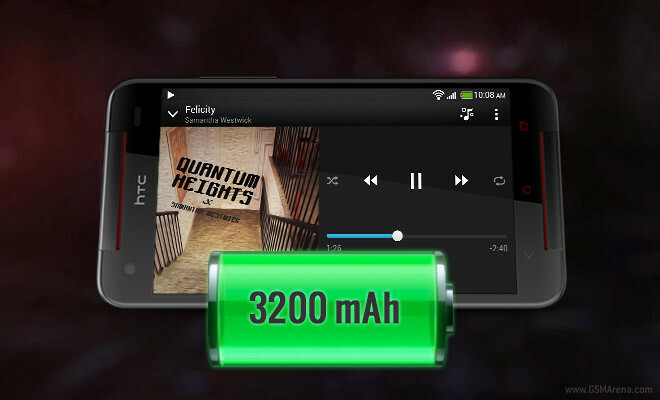 The newest high-end smartphone from HTC, the Butterfly S, shares many of its features with the HTC One, but one area where it has the aluminum flagship beat flat is battery capacity. The huge 3200 mAh battery of the Butterfly S rivals the capacity of our current champion, the Motorola RAZR MAXX, but is its software optimized well enough to challenge the Motorola offering? Find out inside. The Butterfly S features a quad-core 1.9GHz Snapdragon 600 (200 MHz faster than the one found on the HTC One), with a large 5-inch 1080p display and an eye-catching (but unfortunately fingerprint-prone and easy to chip) paintjob. Although you won’t find the same build quality as on the One, you should definitely get more time between charges. Let’s dive right into the tests, starting with 3G talk time. As expected, the Butterfly S landed towards the top of our charts with a score of over 19 hours. It doesn’t stack up to the 25+ hours recently posted by the Huawei Ascend Mate, but that one had an even ampler 4,000 mAh juice pack. 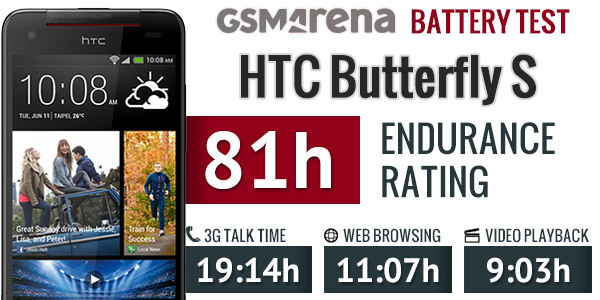 In our web browsing test the HTC Butterfly S got really close to topping the chart, beaten only by the Sony Xperia ZR – and that device only has to power a 4.5″ 720p screen. If you do a lot of web browsing, you’d be hard pressed to find a better phone for the job. Multimedia playback is where we saw the Butterfly S show a hint of mortality, offering a time of just over 9 hours. That’s not bad and will suffice for even the longest of trips, but it’s not quite as impressive as the other two tests either. Factoring in the above results with the Butterfly S’s excellent standby time, we get an overall endurance score of 81 hours. This means that you’ll have enough energy to last almost three and a half days if you use the Butterfly S for an hours of web browsing, 3G calls and video playback each day. The 3200 mAh battery on the Butterfly S provides amazing endurance, especially when it comes to web browsing on its large screen. While the 81 hour endurance rating is not enough to dethrone the Motorola RAZR MAXX’s score of 87h, it’s important to note that that device does not have to power the quad-core 1.9GHz CPU or 5-inch fullHD display found on the Butterfly S. The same applies to the phones that beat the Butterfly S in our charts above – when processing power and display fidelity are factored into the equation, none of them comes even close.